Instilled with a steadfast commitment to cultivating an original presence and voice Jemeel Moondoc has weathered inclement circumstances that would have crippled others with less resolve. From his often-garish garb, to his singular sound on his horn he seems an artist secure in his place within the free jazz cosmology. Sadly, like so many of his peers, Moondoc’s resilient confidence hasn’t translated into a steady string of recording opportunities. This trend shifted when Eremite took notice and began bolstering Moondoc’s recorded output. Since the label released this disc, as it’s inaugural offering back in 97’ both it’s fortunes and Moondoc’s have blossomed through further collaborations. But there’s something seminal about this first outing- a sense of a musician coming into his own in the company of friends willing to follow his formidable lead. The studio setting is a little unusual, especially considering that Eremite’s focus would soon switch primarily to the documentation of concert performances, but the controlled environment does allow for fine balance between the instruments. From the opening title piece the three players drop into a commensurate, if somewhat diffuse groove. Moondoc moves out front early blowing clipped angular phrases and both Voigt and Cook possess a fluid touch that frees up the trio’s rhythmic center without sacrificing momentum. The Ornette influence that many observers have commented upon in Moondoc’s tone rears its unmistakable countenance on “Another One the Hard Way” as the leader sculpts cerulean-shaded flurries that romp in playful concert with Cook’s cymbal showers and Voigt’s ropy rhythmic braids. Voigt hoists a sharp-edged bow on the enigmatically titled “Improvisation #61696” and cuts a dour swathe in collusion with Moondoc above Voigt’s peristaltic drum patterns. “Campbell’s Soup,” dedicated to trumpeter Roy Campbell finds the trio referencing a structured theme before dispersing again into collective improvisation. Moondoc’s tone is at it’s most measured on this one with only the occasional swerve into unexpected sonorities while Voigt and Cook keep a muscular pulse throughout. Toward the track’s close Voigt’s fingers flex in a knotty solo that tumbles from the uppermost regions of his strings creating an interlude that invites careful consideration. Moondoc winds up a final pitch on the concluding “Ruby’s Riches.” The lusty ballad piece stirs in a medley of romantic emotions with a palpable sense of longing and is the ideal vehicle for Moondoc’s softer side; the musical equivalent of a protracted courtship that ultimately proves successful in the end. 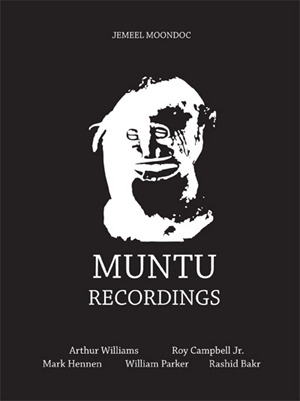 When this disc hit the scene several years ago it served as a manifesto of sorts for both the musicians and for Eremite announcing to listeners the vibrancy of improvised music’s past and it’s ever-unfolding future. Tracks:Triplet/ Another One the Hard Way/ Improvisation #61696/ Campbell’s Soup/ Ruby’s Riches. 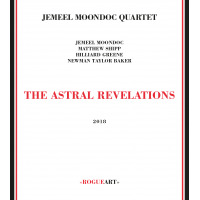 Players:Jemeel Moondoc- alto saxophone; Laurence Cook- drums; John Voigt- bass. Recorded: June 16, 1996, Boston, MA.